As in most motorcycle electrical systems the Aprilia Futura’s alternator generates alternating current from the engine, then sends it to the regulator/rectifier, which turns it into Direct Current at a steady rate to run the bike’s electrics and charge the battery. The generator is in two parts – a rotor, basically a metal drum with magnets inside that rotates around a coil of insulated copper wire – the stator. 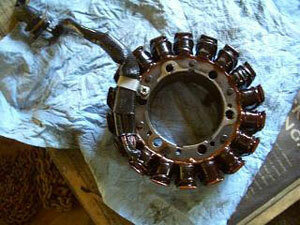 The stator is bolted into the left hand engine casing. Eventually the generator will give up, although this is mostly associated with very high mileage – Dan, who wrote the guide on this page, did his at 66,000 miles so this is unlikely to trouble most of us. Symptoms will be the same as poor charging, with the battery going flat, so the first step is the basic charging test – Read the charging system page for more information. If you’ve established a poor charge rate, it’s easy to test the generator. With the left panels off, disconnect the brown connector (if you still have one!). It has three yellow wires on each side. You want to test the three wires leading into the engine casings. Then switch the bike on and start the engine. Using a multimeter, test the three wires in pairs (three tests). At 4,000 rpm each pair should be producing 60 volts (AC). If it isn’t, then the generator stator is suspect. They usually go off in performance before failing completely. If you’ve established that the stator is at fault, then you have two options – get it rewound by a specialist, or replace it. Rewinding the original usually works out cheapest. If you want to replace it, there is some confusion over aftermarket suppliers. Aprilia list the replacement as a Futura-specific part (part no 0295835) – at over £560! – with an output of 420 Watts. A different part number and output (380 Watts) is listed for other Aprilia 1,000cc Vee twins. However, aftermarket suppliers list one part for all 1,000cc Aprilias, so it’s not clear whether their output will be high enough, or even if it will make a difference. Any guidance to help clear this up would be appreciated. 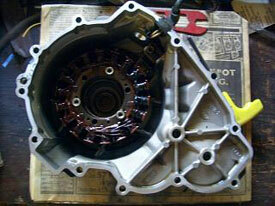 Click below to see Dan’s instructions on how to remove the stator.